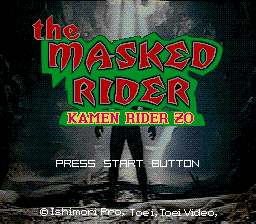 The Masked Rider: Kamen Rider ZO, known in Japan simply as Kamen Rider ZO (仮面ライダーＺＯ), is an action game for the Sega Mega-CD. It is based upon the 1993 film Kamen Rider ZO. Main article: The Masked Rider: Kamen Rider ZO/Magazine articles.